Friday, I began chronicling a Mana Deprived Super Series 3K tournament in Montreal. I piloted Monkey Grow to a 6-2 finish. This article concludes the report and gives some closing thoughts on the deck. We ended Chapter 1 on a high note, following an embarrassing loss to Grixis Twin with a triumphant victory over Abzan Midrange. That match ended in less than fifteen minutes, giving me enough time to rush to Domino’s, find out it would take them twenty minutes to make me any kind of pizza, rush instead to a fast food restaurant whose name I’ll omit out of embarrassment, eat something labeled a burger, and get back to Hotel Espresso just after the round ended. My buddy hysterically told me about his time-induced draw with a furious Lantern Control player, who implored him to concede the match because he “had the lock.” Pairings were announced a few laughs and head shakes later. One of my not-so-pleasant memories from the Super Series is the sustained whining about Amulet Bloom’s purported Modern dominance. I constantly heard unsupported (more on this here) claims from down the table, in the corridors, and by the water pitcher room (yes, water pitcher room) about Bloom being “too resilient,” “too fast,” and “too broken” (my personal favorite) for Modern. When my opponent played a tapped Tolaria West in Game 1 and passed the turn, I smiled at the chance to show some onlookers the deck isn’t as scary as Jund pilots might have them believe. My opponent mulligans to six cards, then very slowly ramps up to six mana. Meanwhile, two non-flipping Delvers and a Tarmogoyf munch on his life total, which seesaws every other turn with a Radiant Fountain. Eventually, I Mana Leak his Titan. He lacks double blue for Pact of Negation, so the Leak resolves, and I win with another Leak and Shoal in hand. Against Amulet Bloom and other linear combo decks, Curiosity overperforms. These decks generally leave the board open for you to pressure them as they assemble their kill, but pressure alone is rarely enough. Without adequate disruption, these decks will race a light clock. Curiosity ensures even a lowly 1/1 Wizard will keep the disruption flowing, preventing combo players from ever resolving their key spells and helping make land drops to further our board presence. Since Bloom in particular lacks creature removal, I feel fine boarding out a pair of Mandrills, my slowest threat, and three Thought Scours for relevant hate. Tarfire dramatically increases a Tarmogoyf clock, and can even grow him to larger-than-Titan stats, so it stays in over Lightning Bolt. The two damage is always relevant to the face, and can even kill Azusa, Lost but Seeking. I mulligan to six and keep a one-lander with Mandrills, Disrupting Shoal, Serum Visions, Probe, and Blood Moon. I Shoal a turn one Amulet of Vigor with Probe, then draw another Probe and see Vesuva, Gruul Turf, Thragtusk, Primeval Titan, Summoner’s Pact, and Summer Bloom. Mandrills resolves in no time off a topdecked Stomping Ground, and I attack while searching for basic Forest. At one point, I scry a Tarmogoyf to the bottom of the library. My opponent resolves Thragtusk after I get a hit in with Curious George, and we trade a big blow. I attack with Mandrills and finally draw Rainforest, but by now I’m at just 9 life. I fetch Forest anyway and resolve the Blood Moon. My locked-out opponent calls a judge for a ruling. He whispers to the judge, who loudly responds, “it will enter as a copy of what you choose, but it won’t tap for what you think it will.” I immediately know he’s referring to Vesuva, and jot the land down on my notepad. Despite knowing the judge gave a faulty ruling, I tell my opponent, “that’s unfortunate.” He agrees and falls deep into thought until the judge returns and corrects himself a couple minutes later. Vesuva comes down to copy my Island. My opponent tries Hive Mind, but I Mana Leak. He attacks with the Tusk, putting me to 3. I draw and Serum, looking for a Bolt or that Goyf I scryed away. No luck. Mandrills trades with Thragtusk, and the Beast token kills me next turn. I put Curiosity on Tarmogoyf, which meets a Slaughter Pact. That’s fine with me; I follow the Lhurgoyf with Mandrills and another Goyf. Khalni Garden generates a blocker that I Tarfire before attacking for eight. My opponent retaliates with Radiant Fountain and Primeval Titan, but I have Mana Leak. I attack again and pump for lethal with Simic Charm. At the end of our match, my opponent chided me for endorsing the judge’s erroneous ruling. I discussed the issue with another judge, who told me I had no obligation to correct that first official, as I could very well not have known the ruling myself. That said, the “ethical play” is pretty obvious here. A friend and I decided it’s important for us to play Magic in an environment where a player legally seeking the correct answer to a rules question has access to that answer. When I tracked down and apologized to my opponent, he said he was upset by my snide remark, and not by my failing to step in. Either way, I resolved to call the head judge next time I experienced something like this, no matter the level of competition – after all, had I been watching someone else’s match, I wouldn’t have hesitated to challenge the ruling. I’m grateful my opponent confronted me about his misgivings and gave me the opportunity to learn from a mistake. Many dislike “playing” against linear combo strategies, but I don’t mind getting paired with a few in a row. The grow archetype naturally predates these decks. While linear combo matches may be boring, they at least offer reliable wins. I also enjoy punishing players for sleeving up linear combo in the first place. A Probe shows me three Violent Outburst, two Demonic Dread, a Blood Crypt, and a Monstrous Carabid. I play Delver and my opponent cycles his Carabid, then I blind flip and start hitting for three. He goes for an early Dread to kill Delver and ends up with just the Carabid. I follow with 4/5 Tarmogoyf, and we trade attacks for a turn. Then, and my opponent cascades again to remove it. I find another Goyf, and unfortunately lack the mana to save him with Tarfire when Carabid + Violent Outburst puts five damage on him during combat. Luckily, my opponent naturally drew his third Living End, so the cascade shows me his deck (which looks pretty standard). I play a pair of Mandrills and quickly attack him down to Tarfire range. I max out on creatures here in the hopes of milling them away with Thought Scour. Stocking my graveyard forces the Living End pilot to spend more time filling his own, slowing down his cascade spells and letting me pressure him with a threat or draw into countermagic for his namesake card. Strapping Curiosity to a resolved threat denies opponents the option to take a few hits before cascading for maximum impact, since every turn they wait potentially draws me two answers. This time, Probe shows me Simian Spirit Guide, Violent Outburst, Monstrous Carabid, Ricochet Trap, Street Wraith, and Avalanche Riders. I play a Delver and my opponent cycles the Carabid and the Wraith. He goes for turn two Living End, which resolves. I play Hooting Mandrills and trade with the Carabid, following up with a 4/5 Tarmogoyf as I stockpile Shoals in my hand. By the end of the match, I’ve drawn three and cast two, conveniently getting around Ricochet Trap with Shoal’s highly specific conditions (the Trap doesn’t cost 0!). With my opponent at 6 life, I flash in Snapcaster Mage on his end step. He lets it resolve and casts Violent Outburst. I Shoal the Living End with Mana Leak up. As if drawing, attacking, and passing against Living End wasn’t fun enough, this round had another highlight. Directly to my left, I got to watch Pascal Maynard on Grixis Twin get ranched by a self-proclaimed Modern newbie on Naya Humans. This kid was literally picking up Kolaghan’s Command to read it. Pascal didn’t take the loss well, rudely dismissing his talkative opponent (a fan of his) and yelling “STUPID!” while slapping his face after taking lethal damage (this really happened). Unfortunately, the kid didn’t win the event, but it made his day to stomp a disgruntled pro he once admired. It made mine just watching! I consider Affinity the best deck in Modern. It’s the fastest and most resilient strategy, putting up finishes even as a known quantity with obvious hosers. Affinity often neglects to run cards like a strictly better Path to Exile and a “Draw 2 cards” effect for U because its other cards are so impressive. It’s foolish not to seriously prepare for Affinity at a larger event. Monkey Grow sometimes gets there via tempo in Game 1, but it usually loses the race. The pressure’s on my well-oiled sideboard to deliver victories against this deck. After my opponent puts a bunch of mana on the table, I counter his turn two Plating and turn four Steel Overseer with Disrupting Shoals. His other big card, an Etched Champion, goes unanswered. I resolve two Goyfs and we attack each other for a while, me on the ground and him in the air with Blinkmoth Nexus and a Vault Skirge. It’s a tight race, with us both falling to three life, but he gets there with a timely Spell Pierce on my Lightning Bolt. Huntmaster is certainly slow, but after I disrupt my Affinity opponent, he’ll win the game on his own. Pyroclasm is mainly useful early on, when it kills a swarm of Ornithopter, Memnite, Signal Pest, and Vault Skirge. Wiping these “mana dorks” slows Affinity way down, and the chance to nab a Steel Overseer makes the card very hot. Mid-game Ravagers can “counter” the sorcery, though. Since Pyroclasm needs to resolve early to do anything, I’m less excited about Firespout here. I mulligan to six, keeping Revelry, Island, Huntmaster, Goyf, Probe, and Visions. Had to ship a hand with Grudge, Pyroclasm, Firespout, and a single Forest, and immediately begin doubting the three-mana sweeper. Serum finds me a Stomping Ground, and my opponent plays Vault Skirge and Spellskite. I Grudge the Skite, then try to Grudge the Skirge next turn and get Pierced. Big mistake – I could have just played my third land and had mana for Pierce. Another Skite comes down. Skirge + Blinkmoth start hitting me. I draw the fourth land for Huntmaster a turn too late, as a Galvanic Blast to the face puts me at 1 and the tiny robots finish me off. In my testing some months ago, I averaged 70-30 against Affinity post-board, so I’m hesitant to blame the deck for my loss. I stumbled badly on my mana here and unbelievably failed to play around a Spell Pierce I knew my opponent was running. While waiting for the Round 8 pairings, I cracked some Khans and did a few pack wars with a friend. She opened an unbelievable “control deck” with Sultai Charm, Bitter Revelation, foil Mardu Ascendancy, Kin-Tree Warden, Barrage of Boulders, Feat of Resistance, a very relevant Naturalize, and Pearl Lake Ancient. Losing horribly to this busted pack cheered me up after ceding a Top 8 spot to another favorable matchup, but as discussed in Chapter 1, winning a hard matchup can really replenish your joie de vivre. The MDSS hooked me up with another Abzan player to lift my spirits. Having money on the line can stress some players out, so my opponent and I skipped the pleasantries during our games. Still, the dynamic match we played was my favorite of the day. I smugly open with Delver. Then I get Thoughtseized, and my turn two Probe shows me a terrifying hand of double Decay, Marsh Flats, Siege Rhino, Kitchen Finks, and Path to Exile. Delver gets Decayed, and my Mandrills gets Path’d. Rhino and Kitchen Finks resolve. Gavony Township earns my concession. Inquisition takes away Blood Moon, leaving me with Denial, Leak, Huntmaster, and some lands. I resolve Mandrills, Deny a Path, and Leak a Tasigur. My opponent finds another Path to remove Mandrills and plays a Goyf, which I shrink to tiny proportions by casting another Mandrills. I play Huntmaster, which soon flips and meets Abrupt Decay. (So does the Wolf a couple turns later.) Then, my opponent resolves and flashes back a pair of Lingering Souls, netting him eight tokens; I attack with the Mandrills and he team-blocks. Simic Charm grows Mandrills to 7/7, and a third Mandrills overwhelms my opponent’s single remaining Spirit. Forgot about Lingering Souls somehow. Firespout seems bad here, too. On the draw, I don’t mind cutting a land against this horribly slow deck with Path to Exile, though my opponent is stunned when I tell him I was on 16. In hindsight, I should have cut Breeding Pool, the only land that forces you to make a fourth land drop to resolve Blood Moon with perfect mana. My opponent follows his Treetop Village with a Tarmogoyf, and I play one, too. He resolves Choke, freezing my Island, and passes. I play Tarn and attack, bluffing a Bolt or a Simic Charm, and get through for three. My opponent plays a tapped Stirring Wildwood, attacks me back, and passes. Then I fetch a Breeding Pool, shock myself, and resolve Blood Moon, which ends up more debilitating to my opponent than his Choke is to me. After a few turns, his hand of Tasigur, Path, Voice of Resurgence, Thoughtseize, and Siege Rhino looks pretty dumb, but so does mine: Snapcaster Mage, Stubborn Denial, Flashfreeze, and two Simic Charm. I resolve a Mandrills and eventually force a double-block with Tarmogoyf and a Spirit. I order damage on the 3/4 Goyf and resolve another Mandrills, which teams up with my own Goyf from turn two (now just 2/3!) to dish out lethal. This match showcases the awesome power of Simic Charm, Blood Moon, and Huntmaster of the Fells against BGx. The Huntmasters didn’t blow any minds at this event, but they quietly ate a pair of removal spells or other creatures every time they resolved. Hooting Mandrills also stood out as an against-all-odds all-star. The card was quickly overshadowed by Treasure Cruise and subsequently outclassed by Tasigur, the Golden Fang after its printing, but its Decay-resistant mana cost, beefy body, and underrated keyword ability make it a Modern staple in my eyes. I got a little too close for comfort with Tasigur while tuning BUG Faeries, and the ability to stabilize out of nowhere on a creature you’d probably run just for the stats is certainly insane. But tacking “trample” onto a similar creature in Tarmogoyf’s colors does even more favors for a tempo deck, forcing weird blocks and turning Simic Charm into a Swiss Army sledgehammer. Wins against Abzan Midrange and losses to Grixis Twin and Affinity taught me I still have a lot to learn about Monkey Grow, especially after a many-month hiatus. Playing it in the Super Series energized my love for this challenging deck, and I won’t be leaving it alone again for a while. For now, I’m sticking with the same build, except reverting to Pyroclasm in the sideboard. I brought this “fixed” version to a Face to Face monthly on Saturday and went 4-0-1, drawing into Top 8 and losing to Kiki-Chord on the back of two egregious misplays. But hey, that’s how we learn. My faith in this deck has never been higher. 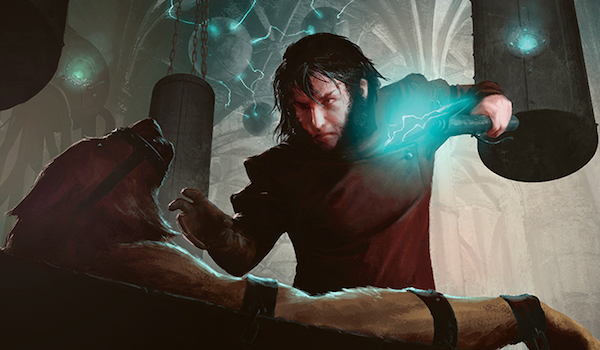 This Modern off-season has been a bit slow, but you can expect more monkeys in the Friday-article-barrel the next time a competitive event rolls around. This has been a excellent write up! LOL for Mr. Maynard story, I hate seeing “Pros” with a super serious, spikey attitude, esp. with new players. Missed opportunity to show class, and IMO, a double loss! I kind of want to say those situations are fun for nobody, but that’s not exactly true – it definitely gave me a laugh. That doesn’t mean such behavior isn’t toxic. After the match I congratulated his opponent with a big hi-five and talked to him about Modern, ignoring a sulky Pascal entirely. I think it’s important not to “feed” his negativity by agreeing with him that his opponent “lucked out” or even paying attention to him at all. Thanks! My favorite thing about Modern is that you can play pretty much any card you want, so long as a strictly better version of that card doesn’t already exist. My personal favorites include Mandrills, Curiosity, Peppersmoke, and Rabblemaster. Actually ricochet trap works pretty well with shoal since shoal reads “if”. So you can target anything with a shoal set to 0 but the spell will be counteted only if the cost it’s 0. It would have been different if it read “counter target spell with converted mana cost x” but that’s not the case. It’s the same as pyroblast an red elemental blast. By the way I love your decks. Now I’m testing the Counter-cats, but I’m planning to test Banana Phone and Curious George too. I’m having so much fun with C-C and pretty good results too. Great to see the latter half of this report, Jordan. I’m very pleasantly surprised by the performance of Curiosity in this shell to ward off the BGx boogeymen, and I can empathize with Affinity’s speed subconsciously pressuring you into walking right into that Spell Pierce. All in all, though, I’m impressed with the deck’s performance, and I think I need to do some more thinking on the subject of Temur Delver in order to incorporate some of the things you have discussed. Curiosity was the best card in this event. Glad I put it back into the list! I’ve been playing Monkey grow since you first started posting about it on MTGsalvation. I have recently dropped bolt intirely, and only play one Steamvents of 9 fetches for Moon in the board. I also added Honored Hierarch, which in my opinion has been excellent in all the BGx Matchups. I did need to cut a Monkey, which let me to move the Denial package to the sideboard along with the 4th Monkey. I think Honored Hierach is very powerful in this deck, because it helps hard casting shoal early on, and also made you able to play out 4 mana threats on turn 3 against the BGx decks. Since i cut ret i had to play Chameleon Collossus, in place of huntmaster. I am very excited that you have started working on your Monkey grow deck again, and i my opinion Curiosity is leagues better than Tarfire. Curiosity is better than Tarfire against linear combo decks and control/midrange strategies, but Tarfire really shines against aggro, and Modern has no shortage of those strategies. Curiosity is not a card you want to see vs. Burn or Kiki-Chord, for instance, whereas Tarfire is literally Bolt #5. FWIW I think you’re insane for cutting Lightning Bolt, but have you had any success with your list? Would be interested in hearing more about it. Do you mind posting a list? Really cool series of article! Also, very interesting to see your detailed thoughts about sideboarding and decision making in games. Which makes me think, given the success you enjoy playing this deck (I know you’re probably a bit disappointed but I’d still call 6-2 more than decent) and how terrible my performances have been with it, that I really need to practice it more. My current version does not run Curiosity but I like drawing cards and at least half the players at my LGS have very grindy decks so I’ll will definitely try it out! Do you think the Burn matchup is good enough that you don’t need Feed the Clan in your sideboard? I lost a lot with this deck when I first built it. You need to stick with it and play a ton. It’s very skill-intensive. I also wouldn’t recommend it for a BGx-heavy metagame, but if you really want to turn some monkeys sideways, Curiosity is where it’s at. Good luck! The idea i got was that my big dudes can stall the grund all they want, i have a high diversity of threats, which means there is away i can get through. Cryptic probably not the tempo-tool that you are looking for, can add up as some reach when you have alot of grund dudes anyway. All our threats are top notch, and with charm combat math is a pain for your opponent. With the higher amount of 1 drops you can easily put pressure on fast opponents, and the bounce is just incredible, with cryptic i have 9 maindeck bounces, and that is all the deck wants, with a Hierarch online it is just fine to keep bouncing the opponents confidant or what ever while you develop your board. ps. sorry i didn’t chech for spelling errors. Ok, i’m going against the grain here, I think Curiosity is a terrible card. It seems very win more and risky as hell in a deck that already 2-for-1’s itself a lot with Shoal. 2-for-1’s in that regards I dont mind at all, since Shoal is an amazing tempo card in this format/deck that people have forgotten about. I realize you seem to be doing well with Curiosity, which goes against all the magic logic I can think of, so you must be getting extremely lucky with your timing of it. Cards like Keen Sense have been around forever, so this is not exactly new tech, and Keen Sense doesnt see any play outside of Bogles. You open yourself up to a blow out if your Delver/goyf gets Abrupt Decayed while you try to cast Curiosity. Even if you connect once, you are just replacing the card you played, so you really need to hit twice for any benefit whatsoever. For a deck that wants to win by turns 5-7, two turns to see any profit seems far too slow. I understand a side benefit is that it can be pitched to Shoal, but that means it is exiled and doesnt grow your goyf. I just feel like it would be dead in your hand a lot, since i wouldnt feel comfortable jamming in on a creature if my opponent is not tapped out or if i didnt have 2 ways to counter war it on there. If you want an enchantment to grow goyf, and is good in the BG(x) matchup, i think your original sideboard card of Spider Umbra is SO much better. If you can sneak it on there, it makes your Monkeys bigger than most goyfs, lets you win the goyf vs goyf/tasigur wars, saves your creature from a kill spell you cant counter, and it turns on ferocious for Stubborn Denial if you put it on a flipped Delver. All these comments seem to focus on Curiosity, which seems like a terrible magic card, even for this deck which ‘protects the queen’. Well, I won’t force you to play it. In fact, I’ll encourage you not to play with Magic cards you consider terrible. You won’t have any fun! Curiosity is frequently phenomenal for me in testing and events, so your opinions definitely won’t cause me to stop using the card. For the record, I played with Curiosity months before I discovered the Spider Umbra tech, which I think is only even better than Curiosity for a Grixis Control-heavy meta, which we’re not seeing now.